Stetson Kennedy, the legendary US anti-fascist, journalist, author and folklorist died yesterday in Florida at the age of 94. He was a man who had a deep impact on progressive politics in the United States along with his friend, the renowned folk singer Woody Guthrie. It took some serious guts to be a progressive and anti-racist in the United States through the Cold War and in a period when the country still practised racial segregation. To infiltrate the Ku Klux Klan and expose them in a book, as Stetson Kennedy did in I Rode with the Klan (published in Britain as The Klan Unmasked), was really quite something. It was one of several books he wrote about racism. 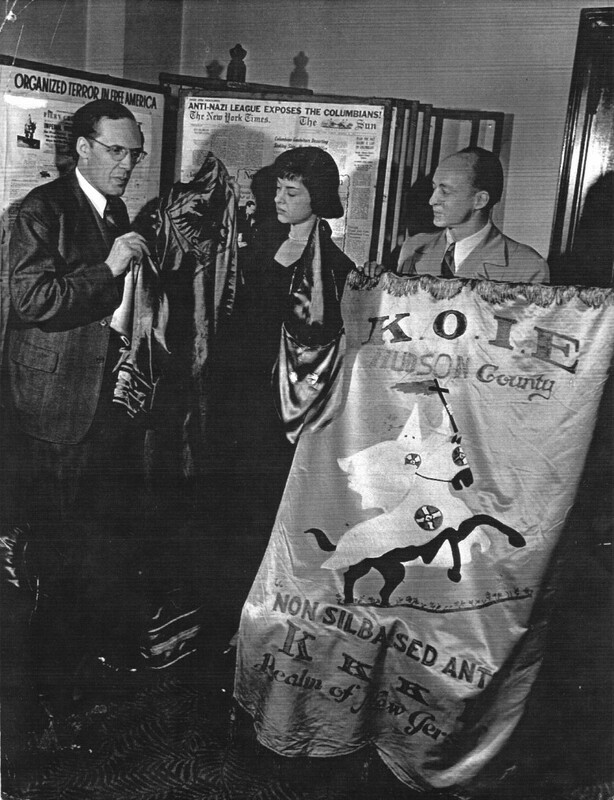 In the 1940s Kennedy was director of the New York based Anti-Nazi League. At that time he wrote a number of reports published in London by the anti-fascist 43 Group, and in the wake of the Notting Hill riot in 1958 submitted a monograph on riot control to the Home Office. In 1950 Kennedy ran for the US Senate. Woody Guthrie wrote campaign songs for him. And many years later, Billy Bragg put one of the songs, called Stetson Kennedy, to music. Kennedy worked for progressive causes throughout his life, right into his final years. In 2000, when I put together a feature on Woody Guthrie with Nick Lowles at Searchlight, Kennedy wrote an article for us about his friend called Woody Guthrie: Natural born anti-fascist. You can read the article here. For lots of information about Kennedy and to read articles written by him, visit his official website here. Picture above shows Stetson Kennedy in 1947 while serving as national director of fact-finding for the Anti-Nazi League, based in New York. Together with colleague Elizabeth Gardner and James Shelton, ANL director, they are displaying the robe and standard of Imperial Klokard Alton Young, who on his death bed converted to Catholicism because the only brother Klansman who came to see him wanted to borrow $5. This entry was posted in Blog and tagged 43 Group, anti-fascist, Billy Bragg, Ku Klux Klan, Notting Hill, Stetson Kennedy, Woody Guthrie. Bookmark the permalink.